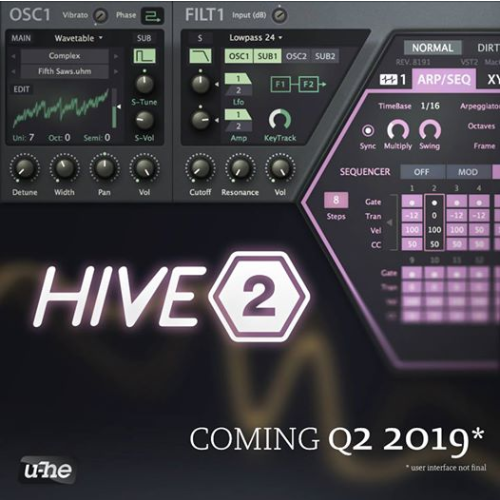 This upgrade will have a completely overhauled user interface, new modulation sources, NKS support, and more... Hive 2 will be backwards compatible with Hive 1.x. Pricing: The upgrade will cost 20€. Users who either recently bought Hive (after January 20th) or will buy Hive before the upgrade is released will get a version 2 license for free. More info in the coming weeks! Apparently each section of the Hive will be color-coded. Plus, it's U-he...you can always make your own skin. My wife knows like 10 kinds of pink, she even has different names for them. But they all are pink! Are you planning to sell lilac nail enamel as merchandise? Hive is my main synth and I'm really looking forward to try v2. That GUI preview looks very slick! The fact that I sold my Hive license 2 years ago, makes me want to hit myself to the balls. Hive (and one preset in it) is the reason why I started to make psytrance.